Though it isn’t your typical Halloween movie by any stretch of the imagination, Dan Gilroy’s “Nightcrawler” might just be the most frightening film of the year – not in the scares it delivers (because there are none), but rather the chilling peek that it provides behind the curtain of a completely different kind of horror: local TV news. 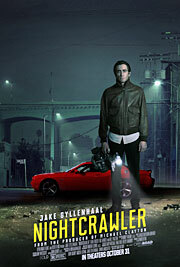 This isn’t the first time that subject has been satirized before in cinema (perhaps most notably in Sidney Lumet’s 1977 Oscar-winning film “Network”), but “Nightcrawler” tells its debauched tale of immorality in the newsroom through the eyes of a Rupert Pupkin-esque antihero more frightening than any masked killer. The cinematic influences are boundless in Gilroy’s directorial debut, but that hasn’t stopped him from producing a truly exceptional thriller highlighted by a wickedly entrancing, career-best performance from Jake Gyllenhaal. The actor stars as Louis Bloom, a petty thief who’s willing to put in the hard work and make a career for himself if someone will just give him a chance. As luck would have it, Louis finds his calling when he passes by a fatal car accident one night and notices the freelance cameramen filming it in all its bloody glory. These guys are like the storm chasers of the TV news world – driving around at night waiting for tragedy to strike so that they can catch the mayhem on camera and sell the footage to whichever news station is willing to pay the most. After trading some stolen loot to a pawn shop in exchange for a camcorder and police scanner, Louis hits the ground running, and before long, he sells his first video to Channel 6 news director Nina Romina (Rene Russo), a kindred spirit of sorts who favors ratings over ethics. Louis has no shame in the barbaric manner in which he captures these moments (to him, it’s just part of the job), and that makes him very unpredictable, because once he gets a taste of success, he’ll do whatever it takes to get the best shot, even if that means crossing lines that aren’t meant to be crossed.